If every non-free stuff is bundled why autoten is installed? Interestingly, I started working on a fedora spin for my personal use. It'll be up on SourceForge soon enough. I saw fusion Linux a few weeks ago and basically had the same reaction as you. I was overjoyed to see a review of it. run the easy command add the non free stuff. easy also adds the fusion repositories. Thank you for your review of Fusion Linux. Because this is a review of beta and not of final release which is a few weeks away that is why you saw your share of bugs. Autoten is updated to latest version in current Release candidate. Brassero is there by mistake in Fusion Beta release, in final release it won't be there. Chromium is the default browser but Firefox4 is there as an option for Firefox die hard fans. Also yum issues have been fixed and yum is working in current release candidate. Also I would like to ask anybody interested in Fusion Linux to drop by the forums and join us and help make Fusion Linux even better. Sweet.Now all I need is an LXDE spin of a Fusion Linux. **hint** Btw just properly mod the hotdog..thingy...into a more anime-ish logo and shade everything to Fedora colors we'll call it even.If anything that uber Fedora's "bleeding edge" seriousness need is some cool humor. Well Java Script is not an application nor a codec. Actually, it's automatically rendered by any browser in its default form, also in Fedora. I believe you meant Java, which is a completely different thing. You are indeed correct sir. Horrid typo on my part. Can't believe I missed that in proof reading, thank you for the correction. Great Idea: as a big fan of Fedora, I have always regretted that the basic install did not include Nvidia, Broadcomm drivers too, even proprietary. I do understand that patents and copyright issues make this unpractical, at least legally. For the codecs, it would be nice to have, but I do agree that rpmfusion has most if not all of them, but which RPM to install has always be a bit of trial and error: lack of clear documentation. My personal opinion, is that rather to create a spin distro for Ubuntu, or Fedora, a distro-patch/enhancer (separate ISO) which by the way could also be a flash drive, able to patch to satisfaction the standard distro we like, would be in my view a better way. 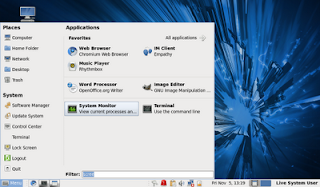 It would have the main advantage to keep full compatibility with the "root distro". A well done menu, would be highly useful, and deserves much work. 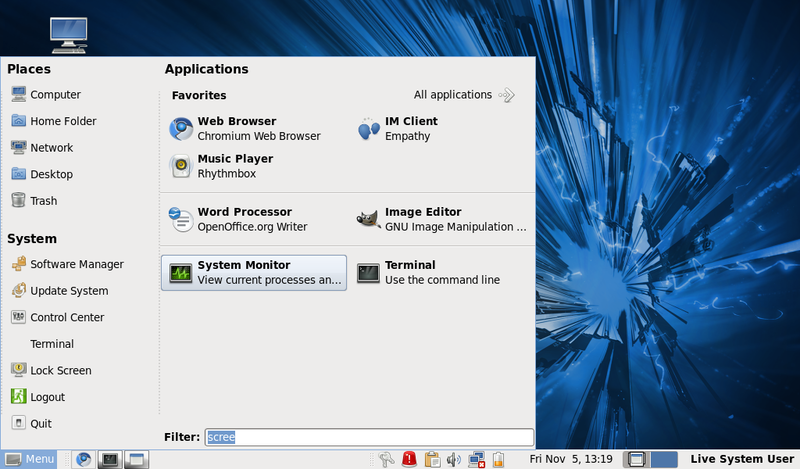 Hi Jeff, i'm new to your blog and ended up reading most of the articles in your blog all day....I have tried Opengue before and liked it very much....i'm again interested in e17 and and installed "Trisquel linux" Lxde in VB and now installing e17.....hope it works.. I wanted to try Fusion Linux but then I looked at the apps in the 14 rc version: F-Spot, Tomboy, Giver, Gnome-Do... So Fusion Linux is a Mono distribution and as such I can't use/try it. I don't want Mono on my linux box, sorry. We released Fusion Linux 14 last week, so I would really appreciate if you took a look at final release. Thank you.